Impressions: What a boring-looking card! The players are chopped out of their natural backgrounds and plastered onto an all-white background. I was pretty happy with landing two “hits” in just five packs, although whoever else pulls from this box is going to be pretty disappointed paying approximately $1 per card and getting not much else. At least it’s a mercifully smaller base set of just 100 cards. An additional 50 rookie jersey autographs make up the rest of the checklist. And I must quibble with UD once AGAIN choosing Andruw Jones as a Dodger representative (Russell Martin was the other in the base set, with Clayton Kershaw part of the rookie set). Really Upper Deck, there was no one else worth depicting? I don’t know, maybe Derek Lowe or Hiroki Kuroda? 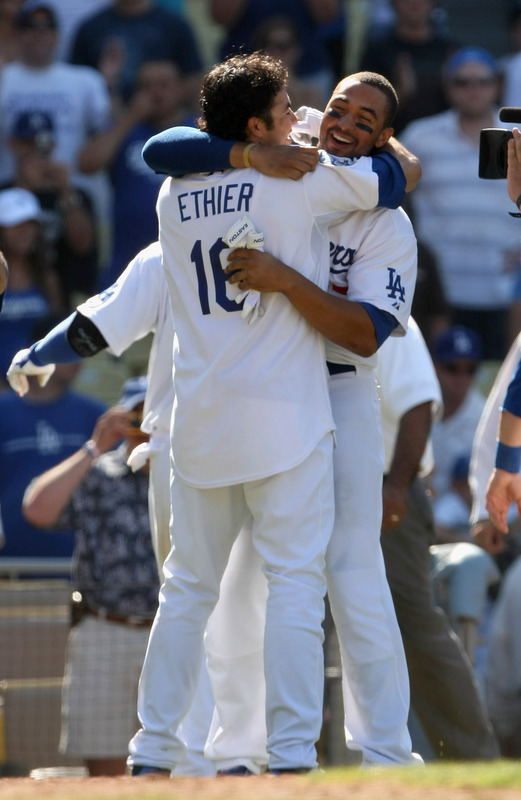 Andre Ethier? What Kent is getting at is that just about everyone, the erstwhile Vin Scully included, is suggesting that Kent’s resurgence over the last three weeks has been solely the result of hitting in the 3-hole ahead of Manny. The idea is that pitchers have been serving Kent a steady diet of fastballs, because Manny is waiting in the on-deck circle. The problem with that logic? What reasonable pitcher is going to extend the effort to put Kent on base? Wouldn’t giving Kent pitches to hit mean that he’s far more likely to get on base, and you know, present an RBI opportunity for Manny? Furthermore, the idea of “batter protection” is largely false. Take a look at the links provided here. There isn’t conclusive data to suggest that a good hitter batting behind you increases the likelihood you’ll see better pitches. In fact, the opposite is much truer. The pitcher is far more likely to extend his effort to get the preceding batter out in order not to provide the “protecting” hitter with an RBI opportunity. It’s completely illogical to suggest that Kent is all of a sudden seeing a steady diet of fastballs now that he has Manny to “protect” him. What is logical is to suggest that Kent was due, and he’s finally producing at the most opportune time — with an even bigger hitter behind him and two big hitters (Matt Kemp and Andre Ethier) in front of him. Just prior to the Manny deal, Kent had been smoking the ball, but was finding fielders’ gloves instead of the holes. I don’t have splits showing this exact time period, but if you’ll look here, you’ll see that Kent’s BABIP (batting average on balls in play) and LD% (line drive percentage), indicators of how “lucky” or “unlucky” a hitter is — Kent was extremely unlucky prior to the trade — have come come closer to Kent’s career norms. So for once, I agree with Jeff Kent. His resurgence has nothing to do with Manny. And anyone watching the Dodgers had to know that Kent was starting to warm up long before Manny was in the picture. But don’t count on ESPN, the LA Times, or anyone else to bother looking into that. “Vin Scully talks too much,” Kent said. Vin might have been wrong about Kent and Manny’s “protection,” but I’ll take Vin’s play-by-play a million times before I willfully listen to any of the other hacks out there. Case in point — yesterday’s TBS broadcast of the Dodgers/Brewers game was presumably a national broadcast, but you wouldn’t have guessed it from the excitement in Chip Caray’s voice when the Brewers mounted their 9th inning rally.